The space station Mir of the Soviet space program was launched, establishing the first long-term research station in space. Mir (Russian: Мир) was a Russian orbital station. Mir was the world’s first consistently inhabited long-term research station in space, and the first ‘third generation’ type space station, constructed over a number of years with a modular design. A middle-aged Russian journalist in Tomsk, Siberia, died Wednesday. He succumbed to injuries allegedly suffered as a young police officer beat him into a coma earlier in the month while in a holding cell reserved for the drunk and disorderly. The injuries included severe damage to many of his internal organs. Authorities identified this little-known reporter who specialized in economics as Konstantin Popov. Popov was one of the cofounders of a small regional newspaper publisher and a local magazine called Tema. 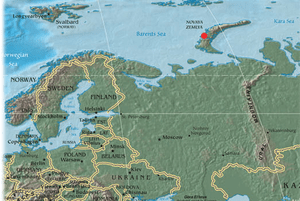 The Soviet hydrogen bomb Tsar Bomba was detonated over Novaya Zemlya Island in the Arctic Sea as a test. With a yield of around 50 megatons, it was the largest nuclear weapon ever detonated to date. Developed by the Soviet Union, the bomb was originally designed to have a yield of about 100 megatons of TNT (420 PJ); however, the bomb yield was reduced by half in order to limit the amount of nuclear fallout that would result. Only one bomb of this type was built and tested on October 30, 1961, in the Novaya Zemlya archipelago. A mock bomb is on display in the Russian Nuclear Weapons Museum in Sarov. The term “Tsar Bomba” was coined in an analogy with two other massive Russian objects, the Tsar Kolokol, the world’s largest bell, and the Tsar Pushka, the world’s largest howitzer. Although the bomb was so named by Western sources, the name is now used in Russia. A group of the Venezuelan Armed Forces, led by Mario Vargas, Marcos Pérez Jiménez and Carlos Delgado Chalbaud, staged a coup d’état against then president Isaías Medina Angarita, who is overthrown by the end of the day. In October 1945, the military declared themselves in open rebellion in Caracas and Betancourt called on the people to stage a civilian uprising. Medina resigned, but it is generally acknowledged that the army, except for the rebels, was on his side and could have put down the pardo adecos as well as arrest the insubordinate officers. China and Russia has signed billions of dollars worth of deals during Russian Prime Minister Vladimir Putin’s visit to Beijing on Tuesday. The trip was aimed at bolstering business, political and military ties. Chinese Foreign Ministry spokesman Ma Zhaoxu said that Putin came to Beijing to mark the 60th anniversary of diplomatic relations between the two countries. He said that the Russian leader would also meet with Chinese President Hu Jintao. The two sides are to sign a joint statement of regular high level meetings between the two countries. Preliminary results from Sunday’s local and regional elections in Russia indicate that the United Russia party won a significant majority of votes throughout the country. Central Elections Commission official Leonid Ivlev said vote counts on Monday showed the United Russia party won nearly 80% of the local races. These included elections for mayors, as well as regional and city legislatures. In Russia’s capital of Moscow, the pro-Kremlin United Russia obtained 66% of the vote for city council. The opposition Communist Party came in second, with 13%. Other parties on the ballot failed to reach the required seven-percent needed to secure a seat.